Stunning, endless views of rolling waves, white sandy Beaches and romantic sunsets. 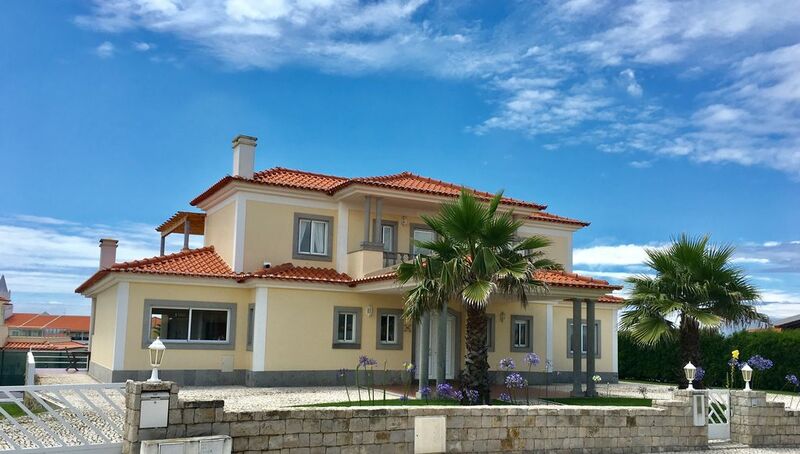 Luxury Villa Praia Belo are situated among the the resort's finest properties in Praia del Rey with only a short walk down to long unspoilt sandy beaches and the 5 star Marriott Hotel. The villa sleeps ten persons respectively. Each bedroom has its own access to a balcony or terrace, with great views of the Atlantic Ocean or surrounding area. The villa offers a large terrace with BBQ and a very private swimming pool. Praia D'EL Rey Marriot: The hotel offers several high-quality dining options, each featuring its own distinct atmosphere and specialized cuisine. Whatever your taste, you'll discover a wide selection of dining offerings with ocean views, live entertainment, great cocktails, featuring buffets and local a-la-carte specialties. SPA: The deluxe spa and salon are fitted with a host of necessities to help sustain your body's well-being. Soothe aching muscles and joints inside the heated saunas and steam baths, or maintain your health by taking advantage of the comprehensive gymnasium. The resort also offers a tennis centre, with six tennis courts. Three en-suite bathrooms with bath/shower, WC, bidet. One ground floor bathroom with bath/shower, WC, bidet. One ground floor guest bathroom with WC and bidet. Price include linen and cleaning. Price include towels and cleaning. We had a lovely stay, perfect for large family gathering. Pool could have been warmer and second tv would have been good, lovely area and plenty to do. A pity Praia del Rey charge so much for the driving range facility and golf. All in all a good holiday. Fantastic two weeks at this property. Plenty of room for 9 of us. Property was well maintained. The villa was large and could easily accommodate two family’s. The villa was very clean and well maintained. The pool was in a warm and sheltered spot and not affected by the Atlantic breeze however a couple more sun beds would have been nice for our party of 9. There were only 4. The beautiful sandy beach is a short walk away. The villa had a prominent position with great views of the fairway and sea. The club house and hotel are a short drive for a drink and meal out. We had some lovely evenings out in the surrounding villages. Very traditional Portuguese. Great food and not expensive. Our family really enjoyed staying at the villa in Praia d'el Rey. The house had plenty of room for us all and it was clean and tidy and modern with lovely ensuite bathrooms and sunny balcony terraces for each bedroom upstairs giving us beautiful views over the sea. The golf course was well used by our family and we loved going for dinner in the club house. The hotel facilities were also enjoyed by us all, including the bars and the spa and we were able to use the wifi at the hotel if we needed a faster connection to the internet. The swimming pool was perfect for us and was used daily as it was a very hot summer! We would really recommend this villa and would love to stay again. The villa was nice but small changes could make it much better. The internet was hopeless. In this modern age with ten adults, some of whom had business to deal with, the speed of Internet is totally unacceptable. Only four sun loungers around the pool for 10 adults also not good. The wooden seats at the outdoor table could do with some cushions. Floors in the property were not as clean as could be. The twin room downstairs had wardrobes that had an awful smell. Overall we did enjoy the week but unless the property was updated would not recommend. We always aim to maintain a good service standard and appreciate feedback. We are sorry to hear that small changes could have made your stay much better. Communicating issues and concerns during the stay to our client manager could have resolved this. We will implement the following with immediate effect: Follow up on the cleaning with the local company, buy more sun lounges. The speed of the internet connection is dependent on the local service provider, but we will investigate changing the provider. This year we invested in replacing all kitchen appliances with Bosch equipment and a new geyser system. It was a great villa! Very smooth transition. The house is well equipped and a stunning home. Great location. Friendly and helpful staff. My family enjoyed it immensely. Will definitely go again. The house Is well equipped. Convenient to walk to the beach, golf, playground and icecream! On a windy night you can hear the ocean and the views from the balconys are stunning . Praia del Rey is within easy reach of the medieval town of Obidos a World Heritage site. This jewel of Portuguese National Heritage was conquered from the Moors in 1148, the town was traditionally given by the King of Portugal to the new Queen. Obidos also boasts a natural lagoon, the ideal spot for sailing, windsurfing or just relaxing. The region also offers a wide variety of wines which are renowned for their quality. White wines are fresh fruity and balanced, while the reds are full bodied. There is an abundant variety of food including fresh fish and seafood from the local village of Pineche. Golf: Praia D'EL Rey is arguably one of the most stunning golf courses in Europe. It is set among extensive pine forests and undulating dunes, with spectacular views over the Atlantic and the Berlenga Islands beyond. Golf: Experience this award winning course, which overlooks the Atlantic coastline from a majestic ocean bluff. Designed by the world renowned American architect Cabell B. Robinson, the Praia D'El Rey Championship Golf Course is rich in variety, providing an excellent test for both the handicapped golfer as well as the advanced player. Take advantage of the onsite pro shop and club house, or sign up for the golf academy - complete with PGA qualified teachers. Discover the full range of professional services and features during your next Lisbon Portugal golf vacation, including: 18-hole, par-72 championship course, beautiful layout, designed by Cabell B. Robinson, first-class golf pro shop and club house, golf academy with PGA-qualified teachers, facilities for private and sponsored events. Minimum handicapped required: Men; 28 and Ladies; 36. *A handicap certificate is required on the time of check-in at the club house.